I had an "oopsie" in the kitchen this morning that actually turned out to be a great discovery!! Despite my creative ways to turn my contest prep and healthy foods into something yummier .. I'm really not a chef. Before I started this health journey I actually NEVER cooked. I had a protein bar and coffee for breakfast, dinner leftovers or whatever I could grab that I CONSIDERED healthy for lunch, packed a balanced snack or two and my husband always made (what we then considered healthy) dinner. So as great as my creations may look/taste .. they are usually just trial and error from me simply thinking outside the box. That is what happened this morning. I accidentally discovered a new, very easy and overall MESS FREE way to make perfectly round little pancakes!! Well ... I hadn't done dishes (we were lazy last night) ... so any pans I would have used for making crepes were dirty. Except this guy .. it was clean .. because I never use it. It's an "Omelette Pan". We registered for this when we got married -- I think it came from Bed, Bath and Beyond. Logically it seemed it could work (since my crepes are just egg whites spread out super thin and flipped) so I tried it. I guess I put too much of the egg white mix in there .. or maybe it was the protein powder I added .. I'm not exactly sure why. But they ended up plumping up and making perfectly round little fluffy pancakes!!! I'm thinking it's because of how the pan cooks the ingredients (it is covered while it cooks unlike when I cook them open faced in a pan).. but it could also be the protein powder (however I didn't add any baking powder like I normally would to make it rise). 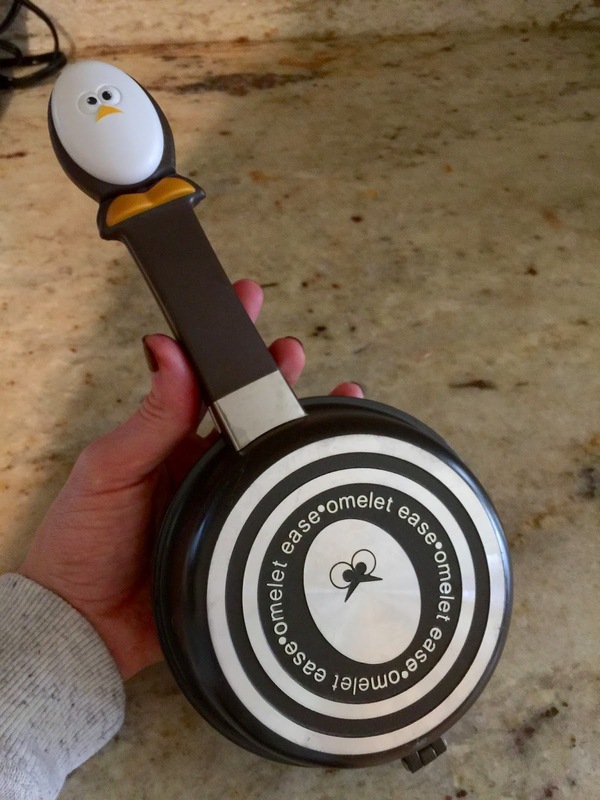 Either way .. forget this little kitchen gadget being used for omelets in my house (I am not a big omelet fan anyway after discovering all the ways I can have a healthy SWEET TOOTH breakfast everyday) -- this will now forever be what I use to make my pancakes! Here is how I made my crepes .. err .. accidental pancakes this morning! You can get creative with any kind of filling. Low sugar/Low Carb Greek yogurt, stevia, fruit and walden farms syrups can create just about ANY kind of yummy filling!!! Pumpkin pie filling, apple filling, cinnamon roll filling, banana filling, strawberry filling - - options are endless and oh so yummmm! Just watch what kind of Greek Yogurt you use. Most are FILLED with TONS of sugar and carbs! BRANDS DO MATTER!!! * 2 teaspoons (ish) of protein powder. Today I used Muscle Sport International Oatmeal Cookie because it's amazing and I'm out of everything else, haha. But I've found that especially for baking -- 1st Phorm and Metabolic Nutrition are the absolute best!! Not all protein powders are equal when baking! Also since this was a meal .. I prefer to use a "blend" instead of a whey. As I've mentioned before .. whey proteins are really best for pre/post workout. Blends are best any other time of day (I often leave this out all together when making crepes ... for them to turn out like pancakes it may be necessary though). Pour 1/3 of the mixture in the nifty little Omelette Pan .. cook one min on med/high .. then you simply flip the pan over .. cook another minute. Check to see if done. Repeat if not. This made 3 little mini crepes pancakes! If you want to make Crepes .. I haven't tried it successfully in this little guy. But in a pan .. you just pour a little of the mixture in the pan (very thin) and then when it starts to bubble .. flip it! Then put your toppings on it (I sprinkle raw stevia, cinnamon and my filling) and then roll up! With my macros it makes two big crepes or 3-4 small ones! * 1/4 container of Kroger Blueberry Carbmaster Greek Yogurt (I could have used much less and it would have been just as good. But the ENTIRE container only has 60 calories and a few carbs and sugars). * 1/2 tablespoon of Jiff Whips - because peanut butter is a healthy fat and makes everything better ;) If you are allowed more -- use it, ha! 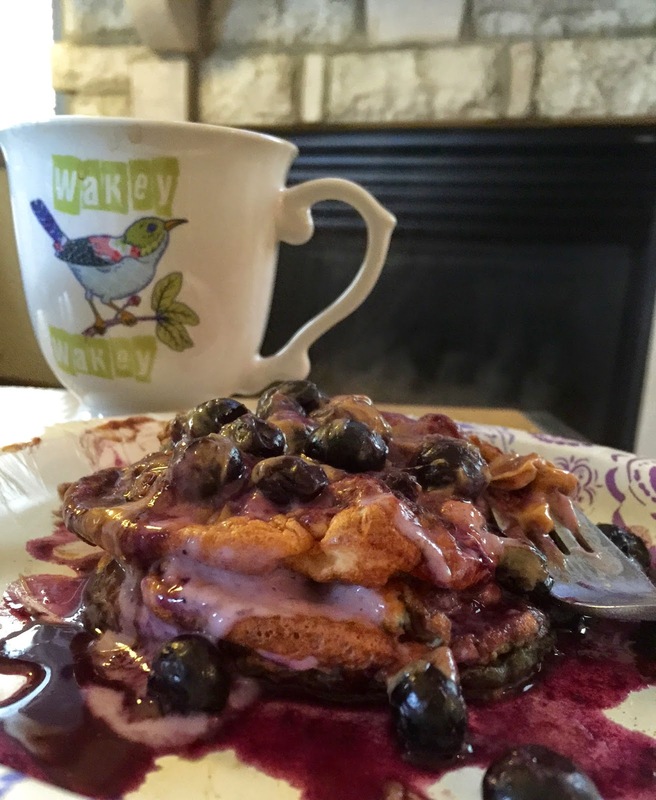 I just layered the crepes pancakes with the "filling" and then topped with 1/2 cup real/fresh blueberries. I put the blueberries in the cup I was mixing the greek yogurt filling in and put them in the microwave for about 45 seconds! It made them a little runny and warm and also the touch of the greek yogurt that was still in the cup was mixed in! A perfect "extra" touch! I then put my measured peanut butter on top and then I actually put my creation in the microwave for 30 seconds (the pancakes had gotten a little cold AND it melts the peanut butter making a little bit of peanut butter go a long way). The "base" of these pancakes honestly taste very similar to my 2 Min Mug Muffin or any basic batter base creation I've posted - which is usually what I have everyday because these pancakes (and the crepes) do take A LOT more time! However you can totally make them the night before! I've done that before and they taste great! The mix alone is perfect for those wanting a lower carb diet for some reason (of course you would need to take out the fruit if you are wanting to go super low carb and just use the yogurt). BUT you all know I am a huge advocate for complex carbs at all (or almost all) meals .. so I ate my crepes pancakes with a bowl of oats on the side -- with cinnamon and stevia! I could obviously add in the oats (ground up into oat powder) and (if needed) the baking powder and they would be my basic batter base pancakes exactly. I am guessing they would just be bigger and fluffier! But again .. for those looking to omit the carbs/oats .. I was shocked how fluffy these turned out without any of the stuff that usually would make them that way! I also like eating the oats on the side .. it feels like I"m getting a ton more food than when I grind them and add them to the batter!